How do I Bind Hard Cover Documents? There are several different ways to bind hard cover documents, including DIY methods that don't need any machines, thermal binding machines, steel binding machines, and punch-and-bind machines. In this post I am going to talk a little bit about all of them. With this information, you should be able to decide if binding hard covers is a feasible option for you and your business. The fastest, easiest, and least expensive way to make hard covers on-demand is with DIY hard covers called Pinchbooks. They require no machine to make and are sold in small boxes of just 5 or 10 (depending on the size), so there is no expensive initial investment; just buy what you need and re-stock as needed, without taking up a bunch of space in your office. Pinchbook hard covers can be made in only a few seconds (seconds...not minutes). 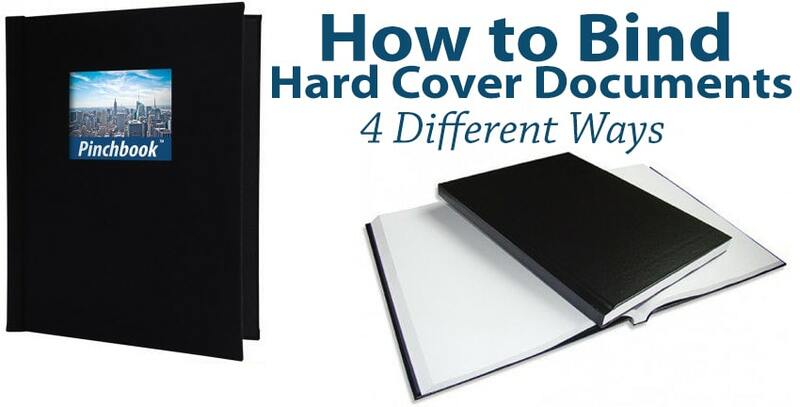 They're clearly very easy, with just 3 steps to securely bind your pages into a professional hard cover. Open up the covers to the point where the spine opens properly. You can feel when the covers reach this point easily when you're doing it. Then slide in your pages and jog them straight against the bottom to square the stack. Lastly, release the covers gently closed to pinch in those pages and bind them. You will find that the bind is strong enough that you can even hold the book by a single page without them falling out (though this might wrinkle your page; so we don't recommend it). They are also editable as many times as you need, so you can re-use them over and over again for different presentations, or just change out pages if you find errors after printing. Pinchbook DIY hardcovers come in several different sizes and colors, as well as either a linen cloth wrap or a faux leather wrap. Some of them have window cut-outs and some of them have solid covers. The hard cover itself is strong and won't bend or break, even with heavy use. This, combined with the ability to edit the contents as often as you need, make Pinchbooks the ideal choice for quick turn-around documents that need to impress clients, and last a long time. Pinchbooks are, however, limited in regards to how many pages you can bind. They will hold up to about 35 sheets of standard copy paper, so a maximum of 70 pages that are printed front and back (or less if you're using thicker paper stock). Thermal binding covers is the first way to bind a hard cover using a machine. The thermal binding process, however, is widely accepted as the easiest and fastest way to bind, period (whether hard covers or soft covers). The hard covers are all pre-made and have a glue strip that is pre-applied into the spines. This means that all you have to do is place in your pages and then place the book into the thermal binding machine. Depending on which machine you have, you can either walk away and let it bind and cool on its own, or you can wait until the machine tells you to move the book to the cooling station. Coverbind thermal binding covers will bind up to about 240 sheets of copy paper, or 480 two-side printed pages. In addition to the standard hard covers, these Coverbind covers are also available with window, or with a printable label with easy deboss alignment, as well as (BONUS!) a huge variety of soft covers; click here to see all of the thermal bind covers available. Thermal hard covers are easy, affordable, and sold in smaller boxes of covers, which keeps the cost low. The machines available include an entry-level manual machine where you move the book through the process (on the binding plate, then to the cooling rack), as well as several different more automated options that will do the work for you. Steel binding is another way to make hard cover documents with a machine. The process is just like thermal binding (in fact, many people also call them thermal binding), except that you would also crimp the cover after it is bound. In addition, the heat is automatically activated when the steel in the cover spine touches, so Unibind steel thermal binding machines won't work with any covers other than the same-brand hard covers with steel spines. The steel thermal binding covers are stocked in standard letter size with a solid front and back cover. There are many colors and spine thicknesses available to bind as many as 340 sheets of copy paper (that's 680 double sided pages). For those of your with a powerful enough punch-and-bind machine --whether for plastic GBC comb binding, spiral coil binding, Wire-O, etc-- another option to make hard cover documents is by punching these pre-made turned edge hard covers. The great thing is that even though they are very thick and sturdy, a lot of standard office-level punch machines can handle them one at a time. Akiles actually manufactured these hard covers to work well with all of their office binding machines, making them compatible with the most popular brand of document binding machines on the market. These hard binding covers are slightly larger than letter size at 8 ¾" x 11 ¼" which provides the perfect amount of overlap of your pages. One major benefit to using these is that they are individual cover sheets, rather than a pre-made cover, which gives you more versatility. The maximum document thickness they will work with will depend entirely on your specific binding method, not on the covers themselves.